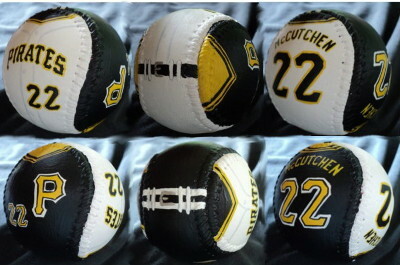 This Legends Andrew McCutchen Jersey Baseball features my original paintings. 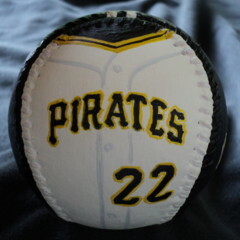 Side one is my painting of the front of Andrew McCutchen's Pittsburgh Pirates home jersey. 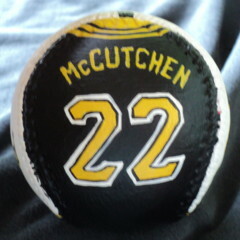 The reverse side has my painting of the back of McCutchen's home jersey. 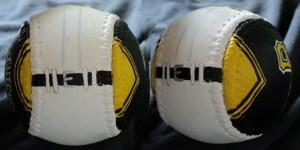 The bottom of the baseball, shows the belt line of Andrew's home uniform. 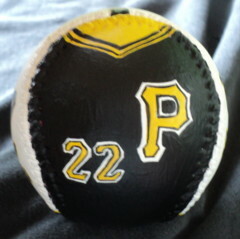 Side three has the front of Andrew McCutchen's road jersey. The reverse side has the back of Andrew's road jersey. 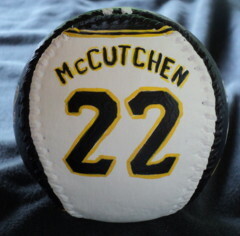 The bottom of the baseball, shows the belt line of McCutchen's road uniform. Black belt with white pants. 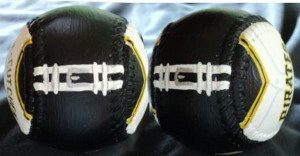 Contact Me to order this baseball (or any other player you want, past or present) or click on the Pay Pal Add To Cart button below to use your credit card or Pay Pal.